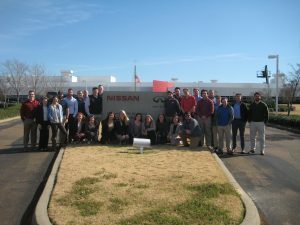 Thirty sustainable supply chain management majors, along with Bank of Ruston Endowed Professor Dr. Tony Inman and Jack and Peggy Byrd Endowed Professor Dr. Kevin Watson, recently traveled to Canton, Miss., to tour the Nissan Vehicle Assembly Facility and Nissan’s tier one supplier, Faurecia. The trip was made possible through a “Just Business” grant that supports faculty and students projects that support the College of Business’ mission to connect business with technology and innovation. In addition to touring each portion of the Nissan plant—from stamping to final assembly and quality assurance—the students met and interacted with Mark Sorgi, Director Canton SCM Production Control, Lester Gonzalez, Senior Manager for SCM Production Control, and Paul Nowak, Senior Manager Design Change. At Faurecia, one of the largest automotive companies globally, students were able to speak directly with company management and Nissan executives. Students also had in-depth opportunities to learn about the procedures and reporting mechanisms in use at the facility.